Why did support for the space program decrease so sharply after (or, really, even before) the first moon landing? Clearly this decline had much to do with the waning of the original Cold War impetus that had sparked the moon program to begin with. As Cold War tensions with the Soviets eased by the late 1960s, and the United States won the space race with the successful moon landing, there was little incentive to continue to expand or even maintain steady funding for a program that, for all its real contributions to technological advancement, entertainment, and national esteem, had largely come to be seen as a Cold War goal rather than a continuing, sustained program of space exploration. In this context, which a good number of Americans accepted, the moon was not a starting point for a glorious era of exploration, but an endpoint in a Cold War race with the Soviets. Unusual works on space history, this fluidly written debut book looks at the Apollo moon landings in the late 1960s and early 1970s from a cultural perspective. 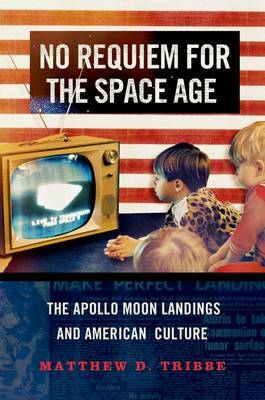 Rather than examining them in their familiar Cold War context, Matt Tribbe uses them to explore larger trends in American culture and society during this period, specifically the turn away from the rationalism that dominated social thought through the 1950s and early 1960s and found its fullest expression in the urge to go to the moon. Rather than studying the space program itself, he focuses more on the peculiarities of an American society and culture that sent men to the moon semiannually over the 1968-72 period, and then stopped. Hippies used the event to comment on the lameness of "straights," straights to lambast hippies. Intellectuals on the Left discussed it in their critiques of American society and culture; intellectuals on the Right discussed it in their critiques of intellectuals on the Left. Those who placed their faith in technocratic rationalism praised it as a triumph of rational planning, while growing numbers of skeptics pointed out the spiritual emptiness of such a rationalist endeavor. The "man in the street," of course, had something to say as well, and he or she expressed a wide variety of views in countless newspapers and television interviews. Meanwhile, armchair philosophers of all stripes, from newspaper editorialists to politicians to NASA technocrats, waxed poetically about what it revealed of "the nature of man" and "mankind's destiny." While not a traditional space history, this book will appeal to those fascinated by postwar culture and society and will particularly add to the growing area of the history of the 1970s.